Aluminium bifolds and uPVC sliding sash windows into this property in the heart of West Malling. 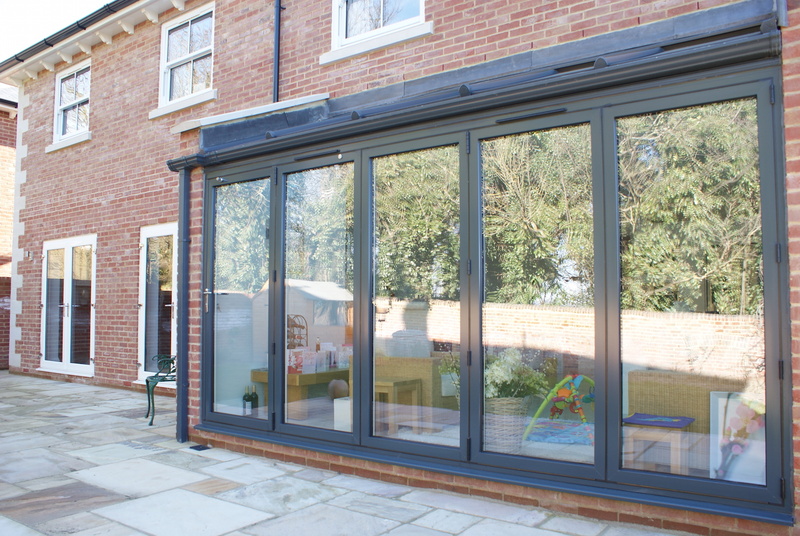 Bifolds have become increasingly sought after in recent years, and this small extension demonstrates why. Creating a great opening and bringing the outside into the main living area was the reason for the extension, and it truly delivers. In a lovely gated development in the heart of West Malling, the new build property originally was thoroughly designed with the traditional in mind. This meant uPVC sliding sash windows fitted down onto thick sandstone cills alongside French doors and a composite door. Later on down the line, the homeowner purchasing the property decided to add a modern glazed extension onto the property. So, we created an effective contrast by using modern grey bifolds and roof. The design for the extension was fairly simple. Extend out two walls about two metres out from the property with colour-matched brickwork and then fit our aluminium bifolds and and a colour-matched grey lean-to roof to create a really nifty modern extension. The customer is absolutely thrilled with the end result and loves the contrast of old and new. The old represented by the traditional sliding sash windows and the new represented by the ultra-modern grey extension with our aluminium bifolds. This is not to say we are not also thrilled with how our uPVC sliding sash windows on sandstone cills have come out, in themselves. We love how the sandstone cills and headstones really set off well against the uPVC sliding sash windows, and in our opinion, are well worth the extra spend. To ensure the extension space didn’t overheat in the summer, we upgraded the double glazing in the extension to Saint-Gobain Planitherm One, which improves the thermal efficiency of the extension and home as well as making it a more comfortable space for the family. All in all, a beautiful property we’re proud to claim as one of our own!